Nonaka-Hill is pleased to present the first Los Angeles solo exhibition of photographs by Shomei Tomatsu. Born in Nagoya in 1930, Tomatsu was a teenager during WWII. Ignoring the air-raid sirens, Tomatsu positioned a mirror so that he could witness the B-29 bombers, “a feast of metallic beauty”, as they destroyed 90 percent of built Nagoya. This memory of a nocturnal “pageant of light” in the sky influenced the compositions of his 1960s “Asphalt” series, a format that Tomatsu revisits in the “Plastics” series, on view here. Shomei Tomatsu is widely regarded as a preeminent photographer of Japan’s post-war period. In a life work chronicled six decades of a changing Japan, he produced several of his country’s best-known, often poignant images. Tomatsu began taking photographs in 1950, and by 1952 he had received praise from established photographers Ken Domon and Ihei Kimura. Initially working as a photojournalist, Tomatsu’s images were more staged and poetic than the refined objectivity seen in the work of his predecessors. Between 1959-61, Tomatsu founded the legendary VIVO photographic agency (with Kikuji Kawada, Akira Sato, Akira Tanno, Ikko Narahara and Eikoh Hosoe) and founded the “Workshop” photography school (with Nobuyoshi Araki, Masahisa Fukase, Eikoh Hosoe, Daido Moriyama and Noriaki Yokosuka). In 1958, Tomatsu began his “Chewing Gum and Chocolate” series, in which he studied the impact of American occupation on Japan. And, in 1961, Tomatsu co-authored the acclaimed “Hiroshima-Nagasaki Document” with Ken Domon, which exposed the lingering effects of the atomic bombs, 16 years after the events. Photographer and essayist, Leo Rubenfien described Tomatsu's Nagasaki photographs as "sad, haggard facts", noting that, as Tomatsu wandered with his camera, "beneath the surface there was a grief so great that any overt expression of sympathy would have been an insult." Of his experience, Tomatsu explained: ”In 1945, its cities devastated, Japan was inundated with American soldiers,“ he wrote. ”We were starving, and they threw us chocolate and chewing gum. That was America. For better or worse, that’s how I encountered America.” Through his his widely published works and engagement in the photographic community, Tomatsu’s expressionistic stance influenced the younger generations, including photographers of the “Provoke era”, Nobuyoshi Araki, Takuma Nakihara and Daido Moriyama, who said: “For me as a photographer, without a doubt, everything began with Tomatsu.” Tomatsu’s work was first seen in the United States in 1974, when Museum of Modern Art, New York presented New Japanese Photography*. The exhibition co-curator, John Szarkowsky referred to Tomatsu as “the pivotal figure of recent Japanese photography”, whose images are "an intuitive response to the experience of life itself". Szarkowski also explained “It was not the rejection of traditional journalism, but the acceptance of a larger and more difficult problem, that defines Tomatsu's identity as a photographer." 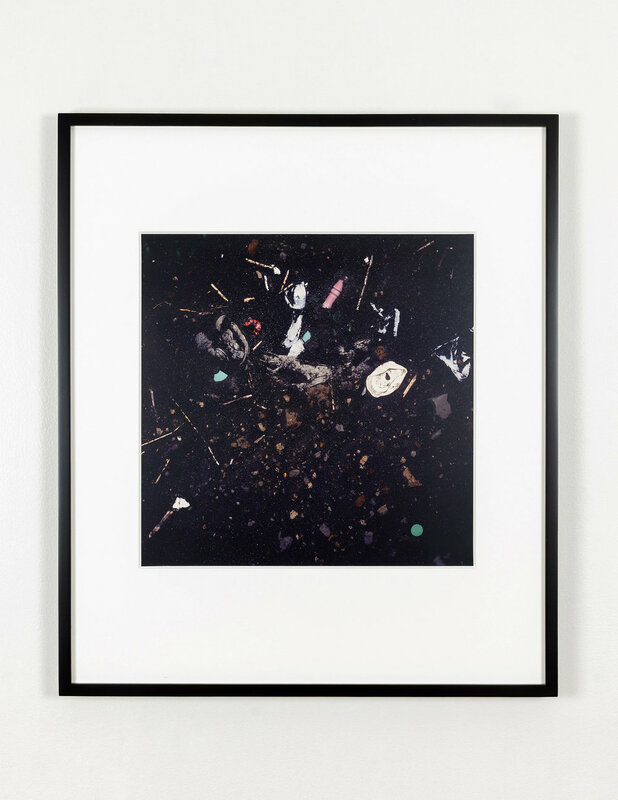 Shomei Tomatsu produced his “Plastics” series in 1987-89, and seven examples are on view here. Tomatsu, in middle-age at the time, was recovering from heart surgery, walking the beaches near his home in Chiba, Japan. His camera captured random bits of colorful detritus, set against the black, glistening sands. 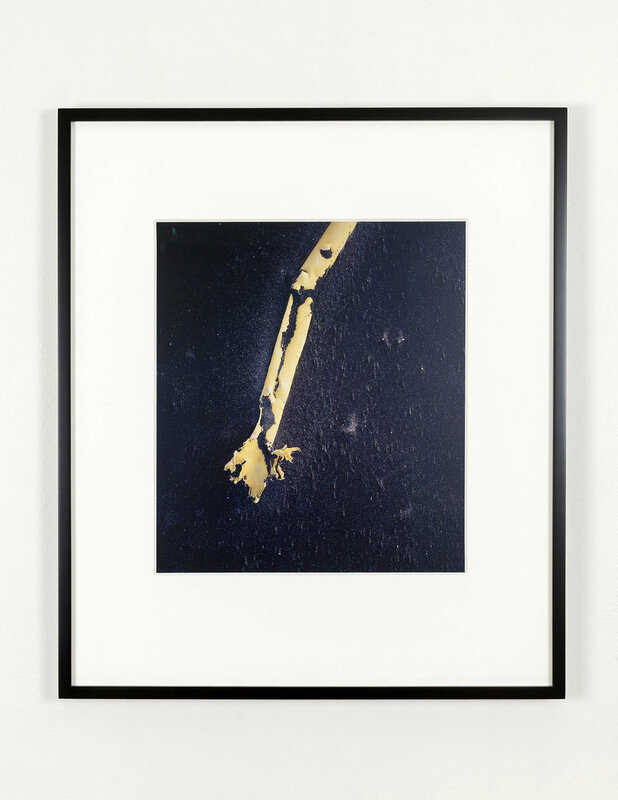 These photos recall Tomatsu’s Asphalt series from 1960, made in his youth while walking the streets, photographing lost and fallen shiny objects imprinted into soft black asphalt, appearing almost as fossils, or the night-time sky of his war-time youth. 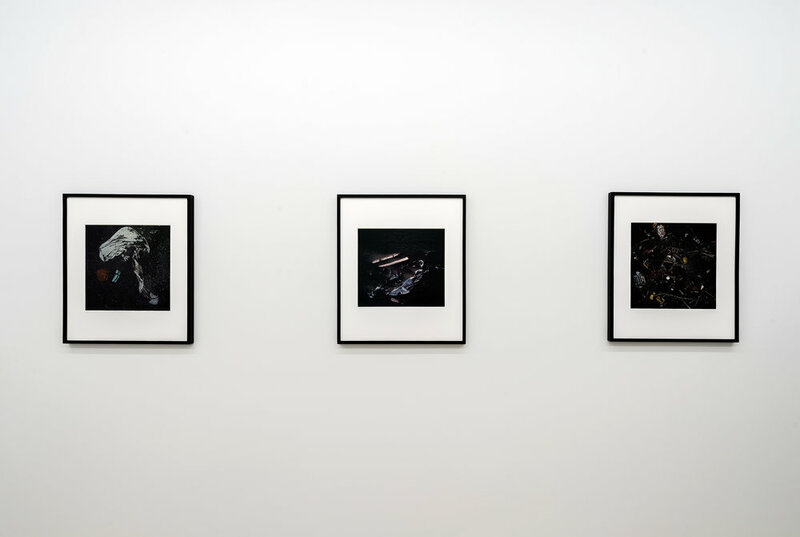 Both series document the imprints of human activity, and evoke the artist’s existential considerations. In 1992, The Metropolitan Museum of Art, New York presented “Photographs by Shomei Tomatsu: Sakura + Plastics”, the museum’s first exhibition dedicated to the work of a living Japanese artist. The two series, shown together, project the artist’s bittersweet relationship with his nation, which saw massive cultural change in his lifetime. Sakura (cherry trees) have been celebrated annually for thousands of years with ritual “Hana-mi” (flower viewing), and remain a symbol of Japanese cultural identity, though the military’s sakura emblem was retired with the war defeat. Tomatsu’s images of the iconic Sakura subject range from intoxicating florals to abject compromise. For his book: “Views of Japan: Tomatsu Shomei”, the artist selected the “Plastics” series as the volume’s sole imagery. After “Plastics”, Tomatsu moved to Nagasaki and to Okinawa, returning to the places where the black and white photographs of his youth were taken. He explored Japan’s southern Ryukyu islands, home to so much American military, coexisting with native islanders, flora and fauna, and produced vividly colorful photographs, recently exhibited at Art Institute of Chicago in Shomei Tomatsu: Island Life. Shomei Tomatsu, born 1930, Nagoya, Japan, died 2012, Naha, Okinawa, Japan Major solo exhibitions include: “Shomei Tomatsu: Island Life”, Art Institute of Chicago (2013), “Tomatsu Shomei: Photographs,” Nagoya City Art Museum (2011), “Tomatsu Shomei: Tokyo Mandala,” Tokyo Metropolitan Museum of Photography (2007), “Aichi Mandala: Tomatsu Shomei’s Landscape,” Aichi Prefectural Museum of Art, Nagoya (2006), “Okinawa Mandala,” Urasoe Art Museum (2002), “Shomei Tomatsu: Skin of the Nation” organized by San Francisco Museum of Modern Art, touring venues in America and Europe (2004-2007), “Interface,” The National Museum of Modern Art, Kyoto (2004), “Nagasaki Mandala,” Nagasaki Prefectural Art Museum (2000), “Traces: Fifty Years of Tomatsu’s Work,” Tokyo Metropolitan Museum of Photography (1999) Among his major awards are the Japan Photo Critics Association Newcomer’s Award (1958), the Japan Photo Critics Association Artist Award (1961), the Mainichi Art Award (1976), The Minister of Education, Science and Culture’s Art Encouragement Prize (1976), The Medal with Purple Ribbon (1995) and The Photographic Society of Japan Distinguished Contributions Award (2005).